Jin Eui’s work has been seen across the world, notably at ArtXchange in the USA, Galerie du Don in France, Lilly Zeligman Gallery in Netherland, Puls Contemporary Ceramics in Belgium, Contemporary Applied Art, Manchester Art Gallery, Scottish National Gallery of Modern Art, Yorkshire Sculpture Park, Ruthin Craft Centre, Oxford Ceramics Gallery, Dulwich Picture Gallery, Barbican Art Gallery, Museum of Modern Art in Wales, National Centre for Craft and Design, Mission Gallery, Bevere Gallery, National Glass Centre, Bluecoat Display Centre in the UK. 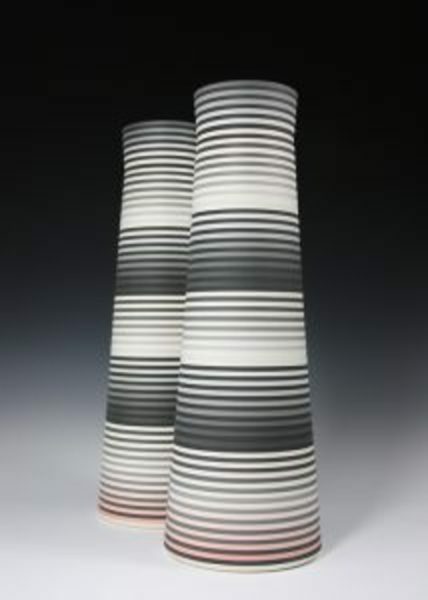 He has been taking part in fairs nationally such as Ceramic Art London, Art in Clay, Art in Action, Oxford Ceramics Fair and internationally Oldenburg Ceramics Fair, AAF in Germany and Art Elysees in France. He especially took part in Collect 2015 at Saatchi Gallery with Ruthin Craft Centre. Industry and artistic recognition has led to selection for the AWARD exhibition in the British Ceramics Biennial in 2013, HOT ROOKIES special exhibition for the Gyeonggi International Ceramic Biennale in Korea. He has recently been announced as winner for Homes & Gardens Designer Awards with China & Glass Category. Exploration with tonal effects and spatial illusions by using gradient in tone, width of bands and interval between bands is Jin Eui’s passion that results in works that are both visually and intellectually challenging.